Stakeholders in Jos, Nigeria have been tasked to be frank in their discussions towards finding lasting solutions to the incessant farmer-herder conflicts in Plateau State. 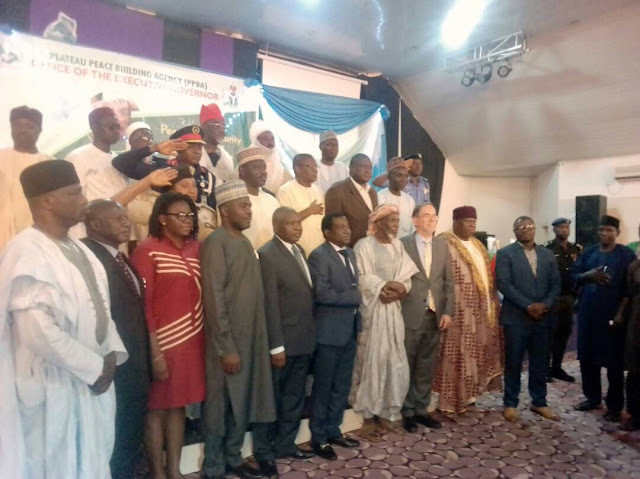 The Gbong Gwom Jos and Chairman, Plateau State Traditional Council, Da Jacob Buba threw the challenge at a three-day Peace and Security Conference, Organized by the Plateau Peace Building Agency in Jos, the Plateau State Capital. The Monarch who regretted the recent attacks and killings in the State said all hands must be on deck to find a common ground in resolving the conflicts in the interest of peace and development. While noting that no society develop in an atmosphere of rancour, Mr. Buba revealed that the traditional institution was also working out modalities to ensure peaceful coexistence among the diverse ethnic and religious groups in the state and country. In a remark, the State Governor, Simon Lalong noted that the program and its theme was apt. The conference according to Governor Lalong is part of government's broader effort to explore, sustain and expand the existing momentum on security and peace building within the framework of the Peace Building Agency's five-year Strategic Plan. Lalong stated that peace and security have always been part of his administration's policy thrust since inception in 2015. "You will recall that the Roadmap to peace was launched by Mr. President early this year. This document is our strategic framework for preventing the outbreak of violent conflict through the detection of early warning sign of conflict and the facilitation of systematic dialogue," he said. Lalong described the conference as a tree planting event that will grow for the benefit of the Plateau and the generation yet unborn. He encouraged the participants to use their wealth of experience to contribute meaningfully during the three days for a lasting solution to the conflict. The representative of the United State Embassy in Nigeria, Mr. David Young said the US government condemned in totality the crisis not only in Plateau but Nigeria as a whole, saying the killings is unacceptable, noting that they share the pains with the government of Nigeria. Mr. Young said Plateau state had suffered heroin attack for more than decades now, working for peace can safe life as he charge security agencies in Nigeria to arrest and prosecute the criminal actors as that is the only way to end the incessant killings. In a keynote address, the former Vice Chancellor of the University of Jos. Prof. Monday Mangvwat caution religious leaders, Politicians and Journalist on their choice of words while speaking on what he described as sensible issues. Earlier, while welcoming guests and participants, Director General of the Plateau State Peace Building Agency Joseph Lengmang said the Agency is very concerned that its various interventions alongside CSOs, NGOs and other stakeholders was punctured recently by the resurgence of violent attacks in the state and said it serves as a wake-up call to all to intensify interventions in the areas of peace building. He said such necessitated the kind of stakeholders involved in the conference saying this is the first of the series of face to face interventions being planned by the Agency. Lengmang then thanked the US Embassy, United States Institute Of Peace and the Mercy Corps for supporting the Agency to put up the conference. The event which had as theme, "Resurgence of Violent Attacks in Plateau State: Forging a Multi Stakeholder Partnership for Peace and Security" had in attendance religious leaders, government officials, Traditional rulers, Women and Youths groups among other stakeholders.